It's been a long, hard road for Adam Greenberg, who was hit in the head during his only MLB at-bat on the first pitch over seven years ago, one that I chronicled in a previous post "Adam Greenberg And The Road To Completeing His Dream Of One At Bat." Tonight Greenberg saw 3 pitches from New York Mets knuckleballer R.A. Dickey before striking out swinging, in-front of his family, the originator of the "One At-Bat" campaign Matt Liston and Fred Van Duzen, who is now the only player in Major League Baseball history to have been hit by a pitch in his only at-bat without taking the field. Greenberg walked back to the dugout to a standing ovation with a smile on his face, having fulfilled the dream of a lifetime. has already been a success." While there are those of us, myself included, that would have liked to have seen him take the field, Greenberg closes this chapter of his story but still hopes to come back for Spring Training to secure a spot on a MLB roster in 2013. No matter what fate hands Greenberg in 2013, he is guaranteed a partial return to the majors, at least in the form of a baseball card. 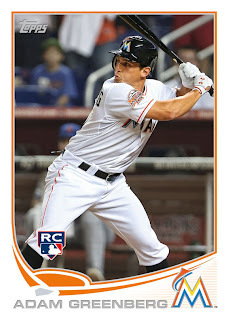 Tonight Topps announced on their Twitter feed "Adam Greenberg embodies dedication, hard work & persistence, proud he will be a part of 2013 Topps Baseball." Topps elaborated on their Facebook page, "Regardless of how Greenberg performed tonight, this is an incredible story! Topps celebrates the dedication, hard work and persistence of Adam Greenberg with an exclusive rookie card in 2013 Topps Baseball Series One." Collectors can start looking for Adam's card, pictured above, in February of 2013. Nice! I will definitely be looking out for that one!